Former Governor of New Hampshire, John Sununu has to be President Trump’s best part-time talking head. He appeared on CNN’s New Day and was interviewed by Anchor Alisyn Camerota about the ‘Russia non-scandal” and let her have it. 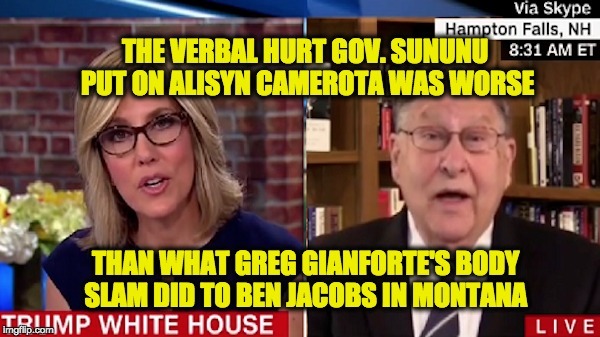 Despite the fact that he didn’t strike her or raise his voice Sununu’s masterful responses did more damage to Camerota than Greg Gianforte’s body slam did to Ben Jacobs. John Sununu is Republican royalty in the Granite State, and indeed the national GOP. He’s served a handful of Presidents, and candidates, been the Governor of New Hampshire, and been advising GOP leaders for a very long time. I witnessed him deconstruct moderator Candy Crowley after the second Obama/Romney debate where the moderator corrected Romney about Benghazi and was totally wrong. The point is that Sununu understands the game of politics and he’s been playing (and winning) for a very long time and he is even better (and calmer) when he is angry. In the interview below Camerota spends several minutes trying to get Sununu to admit that he is “troubled” by the allegations against the Trump team (of collusion with Russia), all she succeeds at doing is proving Sununu’s point about the liberal media. In fact, at one point in their conversation Sununu actually pushes Camerota to admit that there is NO EVIDENCE that President Trump has done anything wrong, or even that anything wrong has actually taken place! He is a master. The implication of course being that all Sununu did was repeat talking points. However, if you watch the segment and read the transcript below, you’ll see that Sununu proves without a shadow of a doubt that the media is biased and the Russia collusion story is bunk. CAMEROTA: Let’s dive into all of these different Russian threads because I want to gauge your feelings on these separately. Let’s talk about what Jim Sciutto, our Jim Sciutto is breaking this morning in terms of reporting. There are these — there were these intercepted communications picked up by our intel agencies that heard Russian government officials talking about some kind of what they called derogatory information they had on Donald Trump, then a candidate, and whether or not they could use it to leverage the Trump campaign. SUNUNU: In the 2016 campaign, that’s right. I came on your show with derogatory business information on Donald Trump during the primary. Why is it a surprise? Why is it a news story that the Russians in Washington would convey the same material to the Russians in Moscow? The same story that you’re quoting at the bottom of the story noted that the same sources that gave your reporter that information conceded that it was possible that the Russians were exaggerating or even making it up. SUNUNU: Why is this even a story worth talking about? CAMEROTA: It is only a news story, you’re right, if, as part of the investigative thread it turns out they were able to leverage the Trump campaign and they were able to somehow use the information they had to help get the Trump campaign to do something that they wanted them to do. So, this is just one more thread down that line where, as you know, congressional committees and the FBI are trying to figure out if they can connect those dots. SUNUNU: Everybody was talking about Trump’s business problems. Why is that news now again? Look, let’s put this whole thing in context. You have to tell me what you think the venality (ph) was that they could have conveyed. CAMEROTA: Well, do you think that Jared Kushner, in attempting to set up a backchannel as has been reported, do you think that the Trump campaign wanted something out of the Russians and there was a dove tailing of agendas? SUNUNU: In the ten weeks between an election and an inauguration, there is a lot of discussion going on between all members of — or potential members of an administration with all kinds of folks. When I was named chief of staff, a lot of ambassadors that were slight acquaintances tried to become good friends in that ten weeks. It is not unusual. You guys have made back channel a derogatory term. Back channel is a positive asset. SUNUNU: Nixon could have not have done China — Nixon could not have done China without a back channel. SUNUNU: Kennedy used back channels. Go ahead. CAMEROTA: During the Cuban missile crisis. I mean, so, you’re saying that during the transition when there is another president, that you are comfortable with the incoming administration using a back channel, if the reporting is correct, using Russian equipment so as not to be caught on the U.S. surveillance and intelligence equipment? You’re comfortable with that kind of back channel? SUNUNU: Well, let’s speculate on why — I don’t think it happened that way. But let’s speculate on why it might have happened. There might have been concerns that the intelligence community was feeding Obama the information that he probably shouldn’t have had. And you know what, with what you are reporting now on what has come out from deep sources in the intelligence community, if that was a concern and I doubt it was, but if that was a concern, they were pretty smart to have those feelings, weren’t they? CAMEROTA: Is there anything about the Russian investigation connected to the Trump campaign that troubles you? SUNUNU: Yes. But the reporting that’s taking place and the exaggeration of venality and the suggestion — look, it’s now seven months since the election. And to this day, no one has cited a single piece of evidence. In your last session, you guys were patting yourselves on the back because you said Clapper had passed the responsibility off to the FBI. But you forget that in the last weeks of the administration, Obama allowed all his intelligence agencies to share their information and there is no question in my mind that when that happened, since Clapper’s group had originated this, that anything the FBI had would have gone back to Clapper. So, it’s nice for Clapper to try and wash his hands of it by throwing it in the FBI’s lap, but he was — had access in those days to whatever the FBI had. There is nothing there. CAMEROTA: So, Jared Kushner, meeting with a major Russian banker of a massive bank that has ties to Vladimir Putin, nothing to see there? SUNUNU: Well, tell me what you think is to see there and I’ll comment on it. SUNUNU: I don’t think there is anything there. CAMEROTA: Why would they do it? SUNUNU: Because during the ten weeks everything is trying to meet somebody who is going to be in the administration. Everybody who is involved in business, everybody who is involved in politics. CAMEROTA: And did you meet with a Russian banker when everybody tried to meet with you? CAMEROTA: Uh-huh. And would you have carved out time to meet with a Russian banker with ties to Vladimir Putin if he asked? CAMEROTA: Well, I’m trying to actually take your temperature. CAMEROTA: I mean I’m trying to gauge your — your comfort level with all of this. SUNUNU: My comfort level — the only discomfort I have is with folks in the media trying to create a veniality without having the courage to specifically tell me what the veniality that I should be concerned about is. SUNUNU: I don’t have — I have not identified an veniality. Have you? SUNUNU: I don’t — I don’t see any evidence of collusion. Do you? SUNUNU: OK. So that’s — that ends — that should end your reporting right there. CAMEROTA: Robert Mueller has just taken over. Robert Mueller has just taken over. SUNUNU: Oh, this is a new investigation. CAMEROTA: For a special counsel to do this, to handle this because — so it gets away from all of the partisan bickering. So it’s just starting in that regard. SUNUNU: OK. Can I ask a question? If Mueller comes out and says that my version is correct and yours isn’t, how much crow are you going to eat? SUNUNU: Of course you do. The whole half hour I listened to is a version. CAMEROTA: Governor — governor, we are asking questions of the sources of the people who know, attempting to see where the investigation is. The investigation isn’t complete. Everyone agrees on that. SUNUNU: Without — without identifying — without identifying a veniality that should be investigated. CAMEROTA: Governor, we appreciate your perspective, that there’s nothing to see here and that the investigation is, I don’t know, silly. SUNUNU: Politically motivated by folks trying to rationalize a horribly run Democratic presidential campaign. CAMEROTA: Governor John Sununu, thank you very much. Always great to get your perspective. SUNUNU: Nice to be here, Alisyn. CHRIS CUOMO, CNN ANCHOR: They’re certainly doing a better job coordinating messaging on how to deal with the investigation. Governor Sununu, always a capable mind and a good political debater to be sure.